D.: God being immanent in all, one should not take life of any kind. Is society right in taking the life of a murderer? Can the State do so either? The Christian countries begin to think that it is wrong to do so. M.: What is it that prompted the murderer to commit the crime? The same power awards him the punishment. Society or the State is only a tool in the hands of the power. You speak of one life taken away; But what about innumerable lives lost in wars? D.: Quite so. Loss of lives is wrong anyway. Are wars justified? D.: Do not one’s actions affect the person in after-births? M.: Are you born now? Why do you think of other births? The fact is that there is neither birth nor death. Let him who is born think of death and palliatives therefore. D.: How long did it take Maharshi to realise the Self? M.: This question is asked because the name and form are perceived. These are the perceptions consequent on the identification of the ego with the gross body. If the ego identifies itself with the subtle mind, as in dream, the perceptions are subtle also. But in sleep there are no perceptions. Was there not the ego still? Unless it was, there cannot be the memory of having slept. Who was it that slept? You did not say in your sleep that you slept. You say it now in your wakeful state. The ego therefore is the same in wakefulness, dream and sleep. Find out the underlying Reality behind these states. That is the Reality underlying these. In that state there is Being alone. There is no you, nor I, nor he; no present, nor past, nor future. It is beyond time and space, beyond expression. It is ever there. Just as a plantain tree produces shoots at its roots, before yielding fruits and perishing, and these shoots, being transplanted, do the same again, so also the original primeval Master of antiquity (Dakshinamurti), who cleared the doubts of his rishi disciples in silence, has left shoots which are ever multiplying. The Guru is a shoot of that Dakshinamurti. The question does not arise when the Self is realised. D.: Is work an obstruction to Self-realisation? M.: No. For a realised being the Self alone is the Reality, and actions are only phenomenal, not affecting the Self. Even when he acts he has no sense of being an agent. His actions are only involuntary and he remains a witness to them without any attachment. There is no aim for this action. Even one who is still practising the path of Wisdom (jnana) can practise while engaged in work. It may be difficult in the earlier stages for a beginner, but after some practice it will soon be effective and the work will not be found a hindrance to meditation. D.: What is the practice? M.: Constant search for ‘I’, the source of the ego. Find out ‘Who am I?’ The pure ‘I’ is the reality, the Absolute Existence-Consciousness- Bliss. When That is forgotten, all miseries crop up; when that is held fast, the miseries do not affect the person. D.: Is not brahmacharya (celibacy) necessary for realisation of the Self? M.: Brahmacharya is ‘living in Brahman’. It has no connection with celibacy as commonly understood. A real brahmachari, that is one who lives in Brahman, finds bliss in the Brahman which is the same as the Self. Why then should you look for other sources of happiness? In fact the emergence from the Self has been the cause of all the misery. D.: Celibacy is a sine qua non for Yoga? M.: So it is. Celibacy is certainly an aid to realisation among so many other aids. M.: Certainly, it is a matter of fitness of mind. Married or unmarried, a man can realise the Self, because that is here and now. If it were not so, but attainable by some efforts at some other time, and if it were new and something to be acquired, it would not be worthy of pursuit. Because what is not natural cannot be permanent either. But what I say is that the Self is here and now and alone. D.: What is Jnana Marga? M.: Concentration of the mind is in a way common to both Knowledge and Yoga. Yoga aims at union of the individual with the universal, the Reality. This Reality cannot be new. It must exist even now, and it does exist. Therefore the Path of Knowledge tries to find out how viyoga (separation) came about. The separation is from the Reality only. M.: To whom is the illusion? Find it out. Then illusion will vanish. Generally people want to know about illusion and do not examine to whom it is. It is foolish. Illusion is outside and unknown. But the seeker is considered to be known and is inside. Find out what is immediate, intimate, instead of trying to find out what is distant and unknown. D.: Which posture (asana) is the best? M.: Any asana, possibly sukha asana (easy posture or the half-Buddha position). But that is immaterial for jnana, the Path of Knowledge. D.: Does posture indicate the temperament? D.: What are the properties and effects of the tiger’s skin, wool, or deer-skin, etc.? M.: Some have found them out and related them in Yoga books. They correspond to conductors and non-conductors of magnetism, etc. But it is all immaterial for the Path of Knowledge (Jnana Marga). Posture really means location and steadfastness in the Self. It is internal. The others refer to external positions. D.: Which time is most suitable for meditation? D.: Tell me what it is! M.: Time is only an idea. There is only the Reality Whatever you think it is, it looks like that. If you call it time, it is time. If you call it existence, it is existence, and so on. After calling it time, you divide it into days and nights, months, years, hours, minutes, etc. Time is immaterial for the Path of Knowledge. But some of these rules and discipline are good for beginners. Mr. Evans-Wentz: Is solitude necessary for a Jnani? M.: Solitude is in the mind of man. One might be in the thick of the world and maintain serenity of mind; such a one is in solitude. Another may stay in a forest, but still be unable to control his mind. He cannot be said to be in solitude. Solitude is a function of the mind. A man attached to desire cannot get solitude wherever he may be; a detached man is always in solitude. D.: So then, one might be engaged in work and be free from desire and keep up solitude. Is it so? M.: Yes. Work performed with attachment is a shackle, whereas work performed with detachment does not affect the doer. He is, even while working, in solitude. D.: Does my realisation help others? M.: Yes, certainly. It is the best help possible. But there are no others to be helped. For a realised being sees the Self, just like a goldsmith estimating the gold in various jewels. When you identify yourself with the body then only the forms and shapes are there. But when you transcend your body the others disappear along with your body-consciousness. D.: Is it so with plants, trees, etc.? M.: Do they exist at all apart from the Self? Find it out. You think that you see them. The thought is projected out from your Self. Find out wherefrom it rises. Thoughts will cease to rise and the Self alone will remain. D.: I understand theoretically. But they are still there. M.: Yes. It is like a cinema-show. There is the light on the screen and the shadows flitting across impress the audience as the enactment of some piece. Similarly also will it be, if in the same play an audience also is shown. The seer, the seen, will then only be the screen. Apply it to yourself. You are the screen, the Self has created the ego, the ego has its accretions of thoughts which are displayed as the world, the trees, plants, etc., of which you are asking. In reality, all these are nothing but the Self. If you see the Self, the same will be found to be all, everywhere and always. Nothing but the Self exists. D: What are the aids for realisation? D.: Can such teachings be discussions, lectures and meditations? D.: How long will it take for one to get that? M.: Why do you desire to know? D.: To give me hope. M.: Even such a desire is an obstacle. The Self is ever there, there is nothing without it. Be the Self and the desires and doubts will disappear. Such Self is the witness in sleep, dream and waking states of existence. These states belong to the ego. The Self transcends even the ego. Did you not exist in sleep? Did you know then that you were asleep or unaware of the world? It is only in the waking state that you describe the experience of sleep as being unawareness; therefore the consciousness when asleep is the same as that when awake. If you know what this waking consciousness is, you will know the consciousness which witnesses all the three states. Such consciousness could be found by seeking the consciousness as it was in sleep. D.: In that case, I fall asleep. D.: It is a blank. M.: For whom is the blank? Find out. You cannot deny yourself at any time. The Self is ever there and continues in all states. D.: Should I remain as if in sleep and be watchful at the same time? M.: Yes. Watchfulness is the waking state. Therefore the state will not be one of sleep, but sleepless sleep. If you go the way of your thoughts you will be carried away by them and you will find yourself in an endless maze. D.: So, then, I must go back tracing the source of thoughts. “Is a Master necessary for realisation?” Mrs. Piggot asked first. M.: The realisation is the result of the Master’s grace more than teachings, lectures, meditation, etc. They are only secondary aids, whereas the former is the primary and the essential cause. T.P. Ramachandra Iyer (TPR), was an efficient lawyer. He represented the ashram in court cases from 1938. In the latter half of the 1940s, he retired from his profession and came to stay with Bhagavan in the ashram for good. He also had the golden opportunity of serving Bhagavan as one of his personal attendants till Bhagavan‟s mahanirvana. During this period he had many intimate dialogues with him, mostly when they were together while walking, or resting at night inside the hall. During TPR‟s last days, I had the privilege of winning his confidence and bringing him into the ashram premises. He lived in Chadwick‟s cottage. He was very kind to me and shared with me many unrecorded reminiscences of rare happenings that took place in the presence of Bhagavan. While walking on the hill, TPR asked Bhagavan whether it was ever possible to totally eradicate one‟s karma or fate, summarily, in this birth itself. “Oh, yes,” replied Bhagavan. “It can be done, one hundred percent, if you do as I tell you!”. TPR readily agreed. “The totality of one‟s karma,” said Bhagavan, “is divided into two: (i) the past, i.e., memories of incidents, success, failure, change, pain, pleasure, growth and decay, etc. (ii) the future, i.e., desires of impending ambitions, achievements, plans and their executions, etc. If one is prepared to completely erase the past, that is, all that has happened to one till this present moment, then fifty percent of one‟s karma will be warded off!” TPR interrupted and asked, “what about the other fifty percent?” Bhagavan smiled graciously and said, “If you have succeeded in giving up the past, that is, fifty percent of your karma, you will yourself realize that the remaining fifty percent is also destroyed. Simultaneously. With past and future erased, there will only be the NOW!” “How does one achieve this almost impossible act of completely eradicating the past?” pleaded TPR. 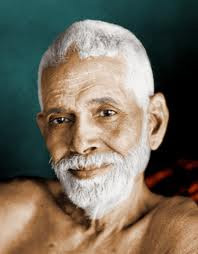 The ocean of grace and compassion that Bhagavan ever is, replied, “Accept and see without any trace of doubt or reaction, that whatever has happened up to the present moment is only through God‟s injunction. One will then get tremendous energy to totally erase one‟s past, on the valid ground and inner understanding, that no one through one‟s effort can ever change or alter one‟s past”. One Dipavali day, Muruganar wanted me to write something about Dipavali. ‘Why don’t you write? Why should I?’ I asked. He said that he would also write if I did. I agreed, and wrote these verses.
" He is the king of hell who says that he is the body which is hell itself. He is Narayana who ascertains who Naraka is, and destroys him with His vision of wisdom, Jnana Drishti. That is the auspicious day of Narakachathurdasi." "The false belief that this hell-like house called body is me, is Naraka himself. To destroy that false belief and let the self shine as Self, is Dipavali." “Is salt also one of those things that stimulates rajas, (passion)?” I asked. “Yes. What doubt is there? Is it not said so in one of the granthas (books)? Wait, I will look it up and tell you,” said Bhagavan. “Isn’t it enough if Bhagavan says so? Why a grantha?” I said. Not only do we not give up salt, but we always feel that chillies also are necessary for taste. That is how we have our rules and regulations about our eating habits. Great souls eat to live and serve the world, while we live to eat. That is the difference. If we eat to live, there is no need to think of taste. If we live to eat, the tastes are limitless. And for this purpose, we undergo ever so many trials and tribulations. We always act freely according to our wishes. We ask for this and for that and become enslaved to desires. We achieve our desires by asking or ordering. Bhagavan depreciates not only the use of authority in such matters, but even obtaining such things by asking. Siddhi is to know and realise that which is ever real. Other siddhis are mere dream siddhis. Would they be true when one wakes up from one’s sleep? Those who are wedded to truth and who had got freed from maya, will they get deluded by them? Please understand.